French 15th-century brown calf blind-ruled in a geometrical pattern, with 3 of the original studs. 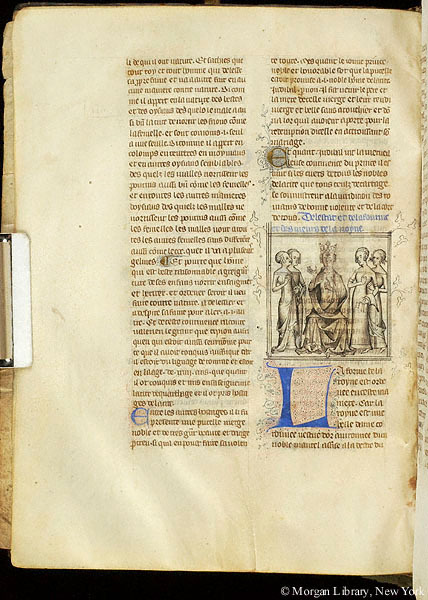 Jehan Furet, Canon of Mâcon, fifteenth century (name is written on the back inside flyleaf); purchased in Oct. 1958 from Arthur Rau, Paris, for William S. Glazier (1907-1962), New York; deposited in the Pierpont Morgan Library by the Trustees of the William S. Glazier Collection in 1963. Ms. written and illuminated in northern France, probably Paris, ca. 1350-1360. The translation of Jean de Vigny. Decoration: 1 large miniature, 28 small miniatures in grisaille.